The relatively small size of cupcakes makes it difficult to hide any imperfections that happen when you pry the stuck ones out of the pan. 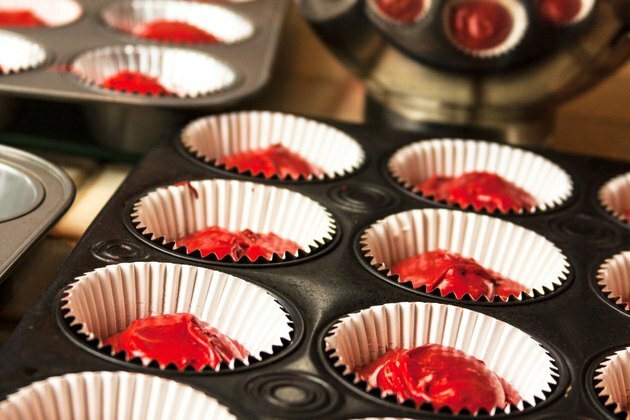 Of course, you can prevent sticking by using paper cupcake liners in your pans, but that's not your only option. If you prefer cupcakes without paper liners, grease and flour the pan so the cupcakes come out without sticking. Grease lightly each cupcake well with butter, vegetable shortening or margarine. Cover every part of the well, especially the bottom. Sprinkle flour over the cupcake wells. If making chocolate cupcakes, use cocoa powder instead of flour. Tilt the pan to all sides while lightly tapping it to spread the flour or cocoa over the entire greased surface of each cupcake well. Pour the cupcake batter into the pans and bake according to recipe directions. Remove the cupcakes from the oven and allow to cool for 10 to 15 minutes. Allow the cupcakes to cool for 10 minutes, then turn gently onto a clean towel or cooling rack. Instead of butter and flour, use baker's spray, which is a spray oil with flour already in it.